The South Indian state of Tamil Nadu has been ruled alternately by two “Dravidian”political parties since 1967.One is the Dravida Munnetra Kazhagham(DMK)under the command of nonagenarian Muttuvel Karunanidhi. The other party currently in the saddle is the All- India Anna Dravida Munnetra Kazhagham(AIADMK)which is led by Jayalalithaa Jayaram who was removed from chief ministerial office due to being convicted for corruption.Both the DMK and AIADMK face an uncertain political future at this point of time due to the uncertainty factor concerning their respective leaders. DMK leader Karunanidhi is in the twilight of his eventful life and it is only a matter of time before the law of nature prevails.The heir apparent is Karunanidhi’s son MK Stalin but there are grave doubts as to whether he has what it takes to steer the ship in the manner his father has done for 45 years. Besides Stalin’s elder brother MK Azhaghiri has already revolted against the prominence afforded to the younger sibling. The danger of the part fragmenting after Karunanidhi’s demise looms large on the horizon.There is also the possibility that Karunanidhi’s daughter Kanimozhi and wife Dayalu may be convicted in connection with cases of corruption in the near future. As for the AIADMK it is very much a party dependent on the leader Jayalalithaa. Her conviction on charges of acquiring disproportionate wealth debars her from holding office for the four years of imprisonment imposed by courts and an additional six years after serving sentence. This effectively means Jayalalithaa cannot be chief minister for ten years at least, unless the verdict against her is overturned or amended by way of appeal to superior courts.Since the party has revolved around her for nearly 25 years after the founder –leader MG Ramachandran (MGR) passed away, it is a moot point as to whether the AIADMK will remain a force to be reckoned with in the coming years under her “circumscribed” leadership. The dismal prospects faced by the DMK and AIADMK has raised hopes within the Bharatiya Janata Party(BJP)of moving into the potential leadership vacuum in the state. In the last General elections in May the BJP led by Narendra Modi swept the poll in many states to form a government with a stable majority in New Delhi. However Tamil Nadu was one of the few states to resist “Modimania” with Jayalalithaa’s AIADMK getting 37 of 39 Lok Sabha seats allocated to the state.Jayalalithaa’s resonating challenge at the hustings “Modi or Lady”resulted in the Lady routing Modi on her home turf. Now that Jayalalithaa is incarcerated and Karunanidhi is basking in golden twilight the BJP is aiming to establish itself as the foremost party in Tamil Nadu and wrench the state away from 47 years of DMK – AIADMK control.What is interesting about this objective is that the BJP is planning to capture the state politically by enlisting the services of a popular film actor Rajnikanth. 63 year old ”Superstar” Rajnikanth as he is called is still the single most popular mass figure among actors in Tamil cinema.During the election campaign Modi himself paid a courtesy call to Rajnikanth. Now the BJP state president Dr. Thamizhisai Soundararajan has visited the Rajnikanth home during “Navarathri”(nine nights)festival and reportedly told Ms.Latha Rajnikanth of the BJP’s interest in getting her husband on board. It is unclear as to what Rajnikanth will do because he has vacillated several times in the past on this issue. Regardless of what Rajnikanth may or may not do, what is of interest here is that even a national party reigning at the centre is being compelled to seek the services of a popular film actor to galvanise itself and capture political power in the state.This is due to the peculiar course of politics in Tamil Nadu where the influence of cinema on politics has been of a phenomenal nature. Popular film personalities have enjoyed great support among the masses.The impact of cinema has been so great that one may very well quip that the way to a Tamil Nadu voter’s heart is through moving images on the screen. How this situation came about is a bizarrely unique story. The involvement of popular artistes in Indian politics dates back to the struggle for Indian independence. Back then it was more a case of singers, musicians and drama artistes involving themselves at a provincial level, where explicit and implicit messages extolling the virtues of Mahatma Gandhi and independence were conveyed to the audience. Social reform was also advocated. Congress party leader Sathiyamurthy was one who recognized the political potential of actors and singers and began utilising their services in the Tamil speaking areas of the former Madras presidency.The singer-actor KB Sundarambal and the TKS Brothers Drama troupe being glittering examples in this sphere. The message of Swarajya was projected through song recitals, street dramas, folk theatre, stage plays and later through silent and “talkie” films. Logic gave way to patriotism in many instances. For example the mythological film “Sathi Anasuya” had women of the Puranic era weave “Khadar” on the hand loom in keeping with Mahatma Gandhi’s tenets. As the film industry bloomed, some films were perceived by the erstwhile British rulers as possessing seditious content. The authorities clamped down on some “objectionable” films, a notable example being the Tamil film Thyaga Bhoomi (Land of Sacrifice) made in -1938. It was written originally for the screen by “Kalki” Krishnamurthy and serialised in the Tamil journal Ananda Vikatan. The film directed by K. Subramanyam spoke eloquently against oppression of women as well as against British rule. The advent of Independence and the early post-Independence years saw cinema and politics take different directions in North India. Though there was some political content in certain movies, there was no overt politicisation. Likewise, a few movie stars did get involved in politics but never played a pivotal role. In recent times many actors north of the Vindhyas have been involved in election campaigns.Several have been elected MP’s with a few becoming ministers too.To generalise , Northern film stars are essentially “ornaments” for the respective political parties and not decision makers wielding real power. However, in South India, and particularly in Tamil Nadu, politics and cinema have been inextricably intertwined in a big way. The larger-than-life image of actors like N.S. Krishnan, M.G. Ramachandran, Sivaji Ganeshan, N.T. Rama Rao, and now Jayalalitha, dominated the political scene. Political leaders like former Tamil Nadu Chief Minister M. Karunanidhi and his mentor and predecessor C.N. 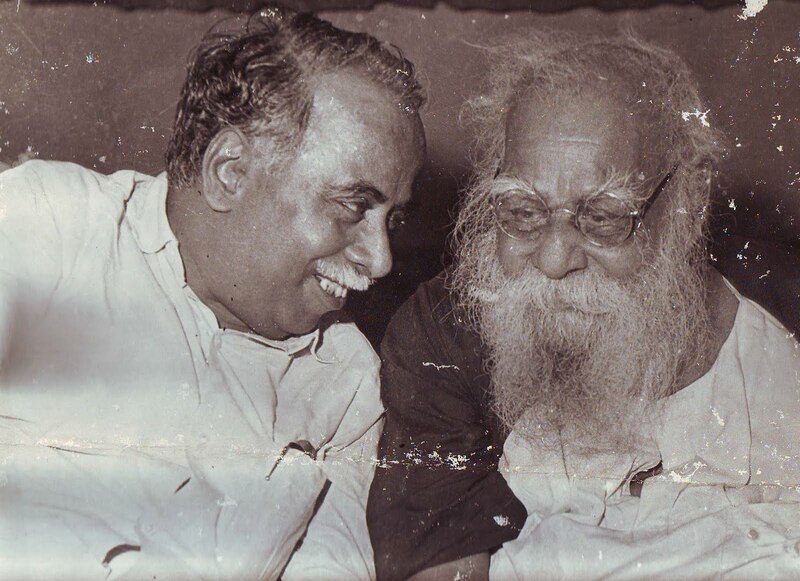 Annadurai also came in from careers in cinema, as screenplay and dialogue writers. 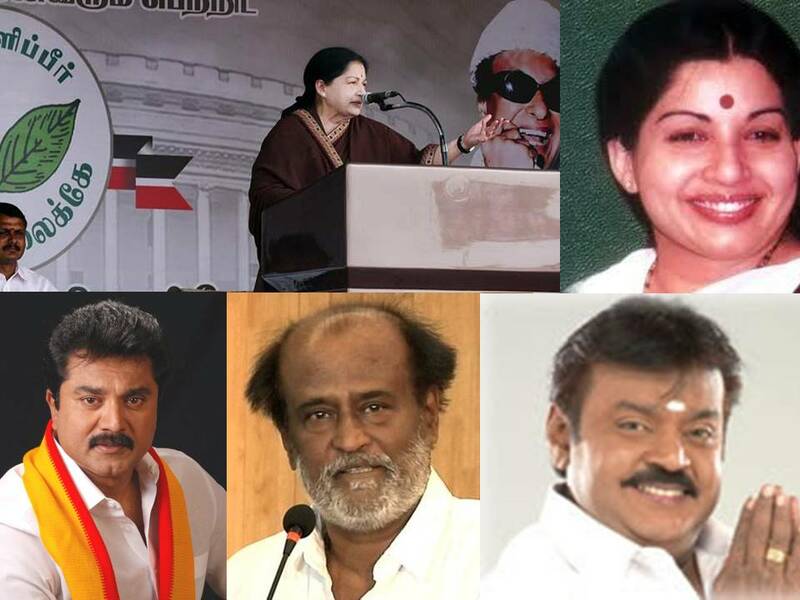 Unlike in the north Tamil film stars served as an integral component of their parties. In most cases, they were the ‘stars’ around whom their parties revolved. Significantly, from 1967, every single chief minister in Tamil Nadu has been a personality with connections to the silver screen.The solitary exception has been the current chief minister O. Panneerselvam nominated by Jayalalithaa as a “caretaker” on two occasions. With a population of more than 70 million , Tamil Nadu has the third highest literacy rate among the states of India. The state is also home to India’s original rationalist movement, started by E.V. Ramaswamy Naicker (Periyar). Known as the Suyamariyaathai lyakkam, or Self-Respect Movement, it promoted healthy political protest against caste oppression, the imposition of Hindi as national language and superstition in religion. Periyar also founded the Dravida Kazhagham or Dravidian Party in 1943, to which both today’s ruling party and chief opposition trace their lineage. In addition to the MGR-Janaki-Jayalalithaa trio of the AIADMK , the first family in the rival DMK camp too has film connections. DMK chief Karunanidhi, is a well-known stage actor and film script writer. He is known as “Kalaignar” or artiste.His nephew and former cabinet minister M.K. Maran – who is no more – was also a former film script writer. Karunanidhi’s son and heir apparent M.K. Stalin too has dabbled in acting, as hero of a TV serial.Stalin’s son Udhayanidhi is a successful film producer who has acted as hero in a few films.His wife Kiruthiga directs films.Karunanidhi’s younger son Thamizharasu’s son Arulnidhi has made his mark as lead actor in some films. Elder son Azhaghiri’s son Dayanidhi is a film producer and distributor. 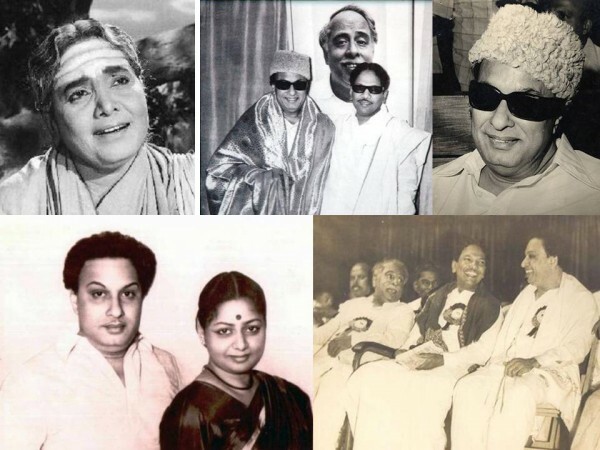 Karunanidhi’s eldest son MK Muthu also had a short lived film career as an actor-singer.Moreover the DMK chief’s “second wife”Rasathi was also a stage actor who got involved with Karunanidhi as his “Thunaivi”by acting in dramas penned by Kalaignar. The role of cinema in the political history of Tamil Nadu provides interesting insights into present-day developments. The politics of Tamil Nadu for the past 75 years has been pervaded by notions of the Aryan-Dravidian divide. This concept itself is not very scientific and has been greatly mythologised. Nevertheless, this consciousness has helped politicise significant sections of the Tamil masses and has sustained whole political parties and movements. According to its proponents, the original inhabitants of India were the Dravidians and it was the invading Aryans who took over the north and pushed the Dravidians southward. In addition, the Aryans also imposed their caste structure on the Dravidians, who had until then a classless society. This hierarchy placed the Brahmins on top. Dravidian ideologues maintained that Tamil Brahmins were not Tamil even though they spoke the language, but were alien Aryan relics. While its social reform platform was quite progressive, the Dravidian movement’s crude version of the Aryan-Dravidian interface and its venomous antipathy towards Tamil Brahmins left much to be desired. Socio-historical reasons had enabled the Brahmins to remain the ruling elite in the state. They were better educated and dominated most fields, including the professions. In addition there was the stamp of authority provided by orthodox Hinduism. The emerging non-Brahmin elites chose to adopt the Dravidian ideology to overthrow what they saw as Brahminic hegemony. The clearly perceived position of power that the numerically inferior Brahmins enjoyed, made them vulnerable targets. The democratic process made easy the mobilisation of non-Brahmin caste groups on the basis of the Dravidian ideology. Dravidian languages are 19 in all, of which Tamil, Telugu, Malayalam and Kannada are the most prominent. Interestingly, there were few takers for the “Dravidian” ideology among the other South Indian states of Andhra Pradesh (Telugu), Kerala (Malayalam) and Karnataka (Kannada). However, it took firm root in Tamil Nadu. The original political demand of the Dravidian parties was a Dravidian state comprising present-day Kerala, Tamil Nadu, Pondicherry, Andhra Pradesh and Karnataka. It later modified itself into a secessionist movement, focused on Tamil Nadu alone. It was only after the 1962 war with China that the DMK dropped its separatist demand in the interests of national unity and security. It now agitates for greater autonomy within the Indian union. Periyar’s Dravidian movement was opposed to participation in politics. It was also very much under his autocratic control. A group of dissidents, including Karunanidhi, revolted under the leadership of Conjeevaram Natarajan Annadurai and formed the DMK in 1949. Starting out as a social reform movement, the DMK later decided that change was impossible without capturing political power through democratic means. In 1957, the DMK decided to enter electoral politics and secured 15 seats in the state assembly and two in Parliament. In 1962, the figure went up to 50 in the state assembly and eight in Parliament. 1967 saw it capture power for the first time when it got 138 out of the 234 seats in the state. The DMK also won all the seats (25) it contested for the Lok Sabha. In 1971, the party registered a landslide victory when it captured 184 seats in the state and 23 in Parliament. The party seemed invincible. But 1972 saw a major split. The DMK’s chief vote gatherer and matinee idol Maruthoor Gopalamenon Ramachandran, or MGR, broke away from the party and floated his own that year. He named it after Annadurai and called it Anna DMK. It was later changed to All India Anna-DMK.MGR’s party won three elections in succession, securing 125 seats in 1977, 130 in 1980 and 125 in 1984. Karunanidhi had to remain content as opposition leader for 11 years. When MGR died in 1987 December, his wife Janaki succeeded him. But the government fell after one month due to Congress machinations. With MGR’s leading lady and then propaganda secretary Jayalalitha also staking her claim to party leadership, a split resulted. In 1989, a divided ADMK contested as two factions led by Janaki and Jayalalitha. The Janaki faction (one seat) was trounced by Jayalalitha (24 seats) but the DMK under Karunanidhi romped home the winner. After Rajiv Gandhi’s death, the Jayalalitha-Congress combine routed the DMK. Only its leader, Karunanidhi, managed to win. In 1996, the DMK was returned to power and retained it till 2001. Jayalalithaa returned to power in 2001 and was de-throned by Karunanidhi and the DMK in 2006.The wheel turned again in 2011 and Jayalalithaa became chief minister. The brief account of the power struggle and its results within Tamil Nadu outlines the vicissitudes of the Dravidian parties in the past years. Of interest in all this is the role played by films and film personalities. It was the DMK that first attempted to use cinema for political propaganda in the post-independence years. Annadurai had once said that if it takes 10,000 political meetings to convey one message, it only takes one single ‘hit’ movie to deliver the same. He and his disciple Karunanidhi set out on that venture. Films scripted by Annadurai like Velaikkaari and Oriravu were well-received, and its political content made great impact. But it was Karunanidhi who really hit it big as script-writer. Karunanidhi developed a writing style that was flowery and alliterative, and it soon became very popular. Courtroom scenes, inquiries in royal courts in historical movies and short dramas introduced into films that had a modern setting, provided ample scope for Karunanidhi’s captivating prose. His reputation had producers advertising their movies by proclaiming, “Story and Dialogue by Kalaingar (Artiste) M. Karunanidhi”. When film titles were projected in the cinema halls, his name would be shown ahead of the stars and greeted with applause. There were others to follow Karunanidhi in both content and style — Aasaithamby, Krishnaswamy, Maaran and Kannadasan. It also spawned a school of actors who could effectively mouth the lines of the script writers. One of the early greats was the comedian N.S. Krishnan, known as Kalaivaanar, who made the audience both laugh and think. Krishnan was followed by a host of “Dravidian School” actors like K.R. Ramaswamy, M.R. Radha, T.V. Narayanaswamy, S.S. Rajendran (SSR) and Sivaji Ganesan. The last two in particular were able to deliver the fiery prose of Karunanidhi with great conviction and style. The Karunanidhi-Ganesan combo was a great success, churning out money spinners like Parasakthy, Thirumbi Paar, Manohara, Kuravanchi and Raja Rani, which ran solely on account of the dialogue and delivery. Personal differences arose between Sivaji Ganesan and Karunanidhi, and the actor crossed over to the Congress. To make up for Ganesan, Karunanidhi, whose dialogues were increasingly getting political, weaned an actor from the Congress camp into the DMK fold. This was M.G. Ramachandran, until then a popular hero playing swashbuckling action roles. When the DMK began using actors for political propaganda, the Congress leader Kamaraj dimissed them derisively as Koothaadigal (performers). This was contrary to the views held by Kamaraj’s political mentor Sathiyamurthy who encouraged artistes in politics.Congress stalwarts argued that those wearing make-up should not enter politics. But the Congress had to soon change roles and rely on people like Sivaji Ganesan and lyricist-script writer Kannadasan who had crossed over from the DMK. In his roles, MGR always took up for the underdog, fighting oppression and injustice. He took special care to project a social message in most songs, and took care to act in different roles so that different segments of the population could relate to and identify with him. The movies, titled simply but astutely, in which he played lead roles include Padagotti (Boatman), Meenava Nanban (Fisherman Friend), Thoilaali (Worker), Vivasayee (Agriculturist), Rickshawkaran (Rickshawalla) and so on. These occupational groups began treating MGR as one of their own.So powerful and lasting has been the MGR legacy that, decades after his death, the crowds cheer madly at the mere mention of his name at election meetings in Tamil Nadu. A unique feature of the relationship between the movie stars of the Indian south and their fans was the proliferation of fan clubs. These clubs would hold special pujas in temples whenever a new movie of their matinee idol was released.Milk will be poured on cut-outs of actors and camphor lit. M.G. Ramachandran probably encouraged the phenomenon of fan clubs from late 1940s onwards, and the clubs ended up as a well-knit federation that counted its membership in the millions. The clubs held annual conventions and also participated in social service projects. When MGR entered active politics, his fan clubs were in turn politicised and soon became an indispensable component of the DMK propaganda machine. Meanwhile, S.S. Rajendran’s fans too were involved in politics for the DMK, and were countered by Sivaji Ganesan’s fan clubs which campaigned for the Congress. Both spheres mutually reinforced each other —film popularity providing political mileage and political positions strengthening film popularity. It was not long before they were rewarded with political office. M.G. R. was made first an Upper House member of the state legislature. Later he contested the state Assembly elections directly and won continuously until his death. S.S. Rajendran also contested the Assembly polls and won; he was later elected to the Rajya Sabha. Sivaji Ganeshan, too, was a Rajya Sabha member for the Congress party. By now, a host of film stars in Tamil Nadu were involved in politics during election time, but not wielding the same clout as the leading stars. The popularity of MGR within the party and state caused major convulsions. In a bid to counteract the phenomenon, Karunanidhi encouraged his son M.K. Muthu to enter movies. The father, while in office as chief minister, wrote the story and dialogue for Muthu’s first film Pillaiyo Pillai (Oh, What a Son). Muthu Fan clubs were set up overnight, with father Karunanidhi’s backing. MGR, realising what was in store, engineered a split within the party on the grounds of corruption charges against the incumbent regime. Incidentally, MGR did not have any problems in setting up new party structures —he merely converted his fan clubs into party branches. The MGR phenomenon was no doubt unique, and his mystique continues its hold over Tamil psyche even today. Before his death, he had come to personify the aspirations of the common people but as more than just a symbol. As political leader, he was also seen as a vehicle for realising their dreams. Jayalalitha symbolises the transition from the MGR era to the present. It was MGR who had, as chief minister, introduced his former leading lady into politics. She was hailed as MGR’s political heir. As propaganda secretary of the party and Rajy a Sabha member, she soon established her power base within the party and emerged as an extra-constitutional authority in the state.Jayalalitha went on to become chief minister and has ruled the state from 1991 to 1996, 2001-2006 and 2011 to 2014. She too set up a fan club network called the Jayalalitha Peravai (Federation). Jayalalitha became a key player on the national scene and enjoyed immense power. Yet much of her conduct was akin to a cheap masala movie where the vamp makes everybody dance to her tune. Jayalalithaa is an autocrat who does not tolerate criticism. There is no inner party democracy in the AIADMK. Jayalalithaa appoints, removes, transfers, promotes, demotes, expels and recruits at her own discretion. Ministers are appointed, fired or shuffled according to her whims. Her wish was the party’s command. None dared to disobey let alone defy. While Jayalalithaa’s haughty demeanor and arrogant attitude deserves to be condemned there is perhaps a rationale for such behaviour. The ascendancy of Jayalalithaa in a Tamil Nadu milieu can be viewed as an ironic contradiction. The dominant political ideology in the state is that of Dravidianism. This is based on archaic concepts of the Aryan – Dravidian divide where the Brahmin community is seen as Aryans and other Tamils as Dravidians. Anti – brahminism is a core element of Dravidian discourse. Jayalalithaa is a brahmin. Thus one can see that the Jayalalithaa phenomenon has gone against the grain of a hitherto dominant political concept in Tamil Nadu. She is a “Paapaathi”(Brahmin woman) ruling the Tamil Nadu anti-Brahminist roost. The success of this embodiment in the socio – political realm of Tamil Nadu is a contradiction. Jayalalithaa in a way is an exception or aberration. Her periods of reign have been marked by unbridled corruption, abuse of power and a vulgar display of ill-gotten wealth. Her downfall came last month , when she was convicted for acquiring disproportionate wealth between 1991 to 1996. Interestingly the accredited opposition leader in the Tamil Nadu legislative assembly is another actor Vijayakanth dubbed as “Captain”by his followers. He is the founder leader of the Desiya Murpokku Dravida Kazhagham.Another actor in Tamil Nadu politics is R.Sarathkumar who is an MLA and leader of the All India Samathuva Makkal Katchi. It is against this backdrop that the BJP is now wooing Rajnikanth.Thus, the peculiar Tamil phenomenon of movie politics continues to dominate state politics and also impact on national politics as a whole. This may have been cinema’s high point, as far as politics goes. But with the dilution of Dravidian politics over the years, there is some expectation that the dominance of cinema in politics may get progressively weaker. This possibility, however, may be offset by the increasing Rajnikanth hype in the state. Rajnkanth is the reigning Tamil superstar, whose hold over the masses is reminiscent of MGR’s. He has a massive fan club behind him, which is exerting enormous pressure on him to enter active politics. At present, he has adopted a neutral stance but may change his mind if enticed successfully. Unlike the earlier Dravidian filmstar-politicians, Rajnikanth has a spiritual streak in him and takes his religion seriously. Analysts predict that if he enters the fray it may be on a Hindu nationalist platform, either in alliance with or as an integral part of the BJP. Given Rajnikanth’s current popularity and the continuing scenario of filmstars dominating electoral politics, there is every likelihood that Tamil cinema will continue to hold sway over the region’s political future. Rajnikanth, however, signifies more than a mere continuum. The bus conductor from Bangalore is a shining example of individual achievement. As the super star himself said in one of his films “Late Aai Vandhalum Latest Aai Varuvaen”(even if I come late I shall be the latest)! « ” Decision on TNA Participation at Railway Inauguration Event was Prerogative of Northern Chief Minister Wigneswaran says ITAK chief Mavai Senathirajah.